It’s really a pleasure write this post… because Oracle Data Integrator 11g just arrives!!!!!!! Well, I’m not sure if you know but I’m an ODI enthusiastic (Did you notice it? 😀 ) and, because of that, I will tell you my ODI 11g impression in 11 blog posts! Isn’t original but liked the idea! hehehehehehe! Well guys, here it is! The first screen from ODI Studio!!! The first is that there is no more 4 separated modules, just one GUI (look into the image) and several commands are, now, accessed from a menu bar. Well, I now that is few information but is just the first of eleven… The next’s post will bring a lot of new information! Do you know how to get the ODI version by command line ? 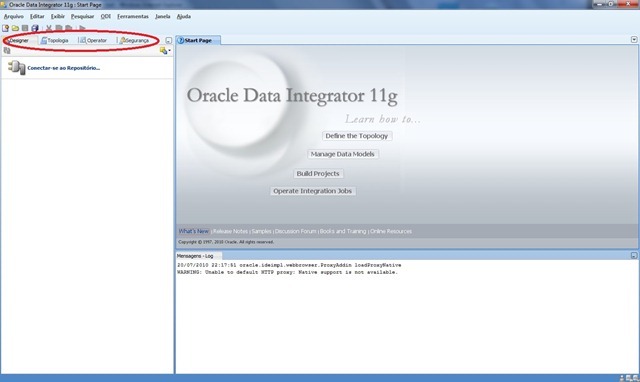 I have installed the ODI 11g, but i am not able find file /login path for ODI STUDIO. I have installed odi 11g with skip repository option. Please help me to find out path to login for 1st screen of ODI STUDIO. Assuming you have installed on windows , you should be able to see in program – > Oracle – > Oracle data integrator (or) a similar path to this D:OracleMiddlewareOracle_ODIoraclediclient and you should able to see odi.exe . Double click and start it and now you will be able to see the ODI Studio . Look into other post for steps creating Repositories. it seems to me that the new release has mainly a new GUI, and a component to integrate ODI with Fusion. I am contrary to this inflation in size which affect about every Oracle product. While ODQ 11g corresponds to the major upgrade of the twin (Trillium Software from 11.5 to 12.0) TS 12, the ODI seems to be not that new in terms of “measurable in $” features. edelivery website under Oracle Fusion Middleware 11g Media Pack. Can you please let me know from where to download the 11g version of ODI. Can you please let me know from where to download the 11g release. Can you let me know from where can we download the 11g version. I am unable to find it on edelivery.